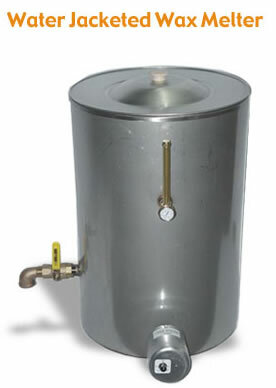 ALL STAINLESS STEEL WATER JACKETED WAX MELTER is ideal as a stand-alone melting tank or as a batch tank. This thermostatically controlled wax melter provides even heating with no hot spots. It's ideal for melting waxes, *gels, and soap products that require melting/pouring temperatures below 200 degrees Fahrenheit. Replacement elements are available for on-site repair. Manufactured on-site in our factory, Rite-Hete Water Jacketed Melters are constructed with superior quality. These heavy-duty melters will provide years of performance for your production needs. Add our EZ Dispensing System for production filling. Order your system today! High temperature Gels may require higher melting temperatures over 200 degrees Fahrenheit. See "VRS Direct Heat Melters" section for higher temperature melting. Type 304 stainless steel crucible and outer jacket, all fabricated in 18 gauge stainless featuring a conical bottom for complete draining. 14" diameter x 16" deep I.D.